Today: We bring you a heated debate on the best frying oil. Frying is a delicate task. When you finally find the courage to plunge your food into hot oil, you only get one shot, and have to watch it like a hawk. We want to equip ourselves with the best frying medium to ensure food comes out as delicately crunchy and not as blackened crisps. That being said -- there is a significant amount of debate over which frying oil is the best: grapeseed, peanut, or canola. And what about the usual suspects of good ol' olive oil or butter? 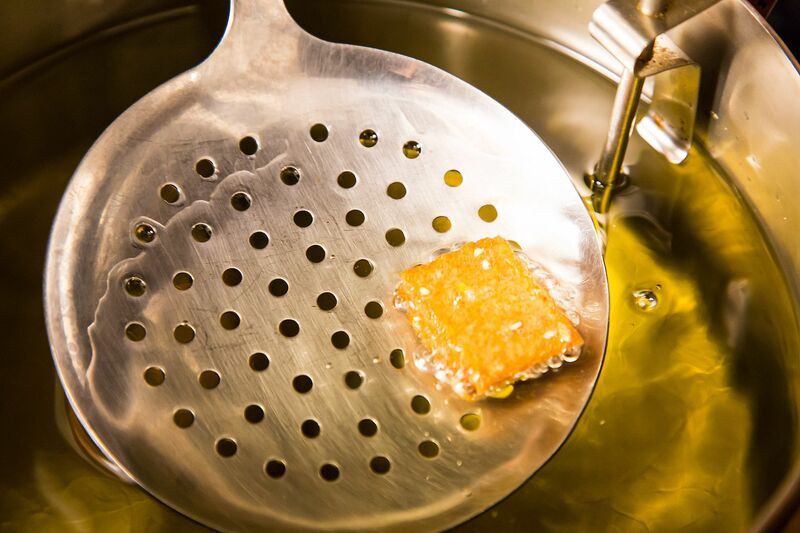 The main characteristic an oil must possess to achieve a successful fry is a high smoke point -- bear in mind the more you use a frying oil the lower the smoking point becomes. We've talked about deep frying without fear, and conducted an pretty exhaustive review of oils, but one night this week fhb was in a bind and needed help choosing the best oil to fry cutlets. Common consensus landed on peanut oil due to its neutral taste and high smoking point. Pierino voted for grapeseed and canola -- not without a challenge by ChefOno, who noted that grapeseed oil possesses potentially unhealthy omega-6 fatty acids, and that canola oil stinks like an old fish when heated (Ew!). Kristen W. threw a curveball and suggested rice bran oil. For those of you still overwhelmed by the oil debate, Greenstuff contributed a helpful oil comparison chart with more oils than you ever knew existed. What is your preferred frying oil? Tell us in the comments! In case you were wondering, fhb reported back, and peanut oil was the clear winner (even after testing against butter). Where is the chart? I received a 404 error. Bigralphsmith, I think all the air fryer comments are more about how everything everywhere you go is a commercial or someone trying to sell you something you DON'T need. Food 52 needs to do a better job of monitoring. MODERATOR: please remove any "air fryer" comments! They make this post and the comments it asked for useless :( I know it's an oldie, but it scores high in Google organic results. Also: tl;dr seems to be peanut oil, but rice bran oil is awesome too if you can get it. I love it when you go to a site looking for information regarding "which oil is best for frying" and a bunch of self-centered people responding about air fryer's. This comment section is a reflection of how blatantly self centered we are. This article is about which oils are best to fry with and it asked people to leave comments on what oils they thought were best for frying. So, what's everyone commenting on? "Ooh, ooh! Get an air fryer!" or "I'm trying to cut down on oils and etc..."
This is how disconnected we are. "Screw what oil is best for frying! I couldn't care less about actually answering the question posed to us in this article! I'm going to talk about whatever I want." Meanwhile, I'm actually going to answer the question. I've tried peanut, coconut, grapeseed, canola, and vegetable shortening. Of all those oils, peanut is clearly the best choice. It lasts longer in the deep fryer, does not degrade nearly as fast as any of the others I've tried, doesn't turn "fishy", it has never smoked on me even when it's old, and, even though it's more expensive, it actually lasts long enough to make it the cheapest option. And, while it might not be the "healthiest" option (we are talking about frying here, remember? ), it is one of the healthier options when all oils are taken in to consideration. If it's only about flavor, depends on what you are cooking. For instance, southern fried chicken is best in fresh vegetable shortening, potatoes and un-battered meats are best in peanut (peanut is the only way to do meat fondues), fried pasta is great out of fresh canola. Thank goodness for your comment. Thanks. Peanut oil it is. Thank you! I'm trying to fry chicken for the first time, deep fry as Chef Jon said in his video. Sadly, I filled my pot with 3 qts of Crisco Vegetable oil before I saw your post about "chicken is best in fresh vegetable shortening" though my sister-in-law told me that's what she uses. I'm 73, she's slightly older. I considered peanut so now I know what to do. While many omega fat oils are incredibly healthy when consumed raw, the fragile bonds in these fats break down when exposed to heat, regardless of their smoke point. These oils might taste great in cooking and not burn, but from a health perspective, the best oils for heat exposure are saturated fat-based such as butter, ghee (organic best) and coconut oil (and taste great too!). Rice Bran Oil! Very light, with a high smoke point. I would not use Olive Oil for high heat cooking. It degrades. Yes, grassfed, pastured lard, especially from leaf fat is great! I've read the secret to the best frying is using lard or adding lard to your oil of choice. I, carefully, use olive oil for some things...and when frying corn tortillas...corn oil is the best ! Cast iron is a time honored material for cooking. Stainless is wonderful. Newer pans are unproven. Remember Teflon? Use good oils/fats that do not degrade, cook at a lower temp. We need good oils & fats in our diet. If you want to cook oil less, steam, poach, braise. I have never stopped using pure organic butter. Lo and behold! Butter has been redeemed. I agree with a previous commentor that one should never use extra virgin olive oil for cooking. Heat destroys its fragrance and it's way too viscous. I find it puzzling when celebrity chefs who should know better use extra virgin for sautéing. I do take issue with a comment that peanut oil is neutral in flavor. It has plenty of fragrance and I can always tell when it has been used. I don't often deep fry but when I do, peanut oil it my go-to choice. Depends on the food you are frying. Deep fat frying I prefer Peanut Oil that has a relatively high smoke point. Sauteing foods, I have used Olive Oil or Sunflower Oil. Since I have learned all the health concerns on Canola Oil (Rapeseed) I have thrown out all I had. Sunflower Oil, all the way. It's one of the healthiest high heat oils and imparts the least amount of flavor, making it super versatile. I personally fry in my cast iron skillet and have friends who are peanut sensitive so peanut oil is out, I have used canola which made my house smell like old fish, and coconut is such a particular flavor it doesn't go with everything. Sunflower oil is really the best I've used. Avocado oil Is the worst for taste and pure lard is the best for taste .Olive oil has a very low smoke point and has to be monitored properly. How about Avacado oil? Heart healthy.